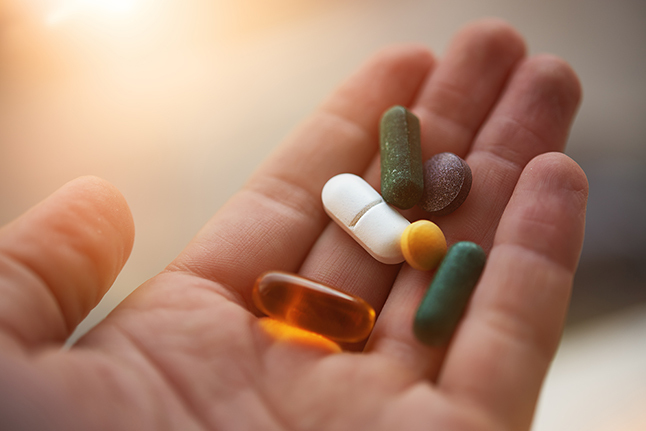 From daily vitamins to bodybuilding products, it is important to realize that supplements are not regulated the same way as medicines by the Food and Drug Administration (FDA). So consider the health benefits — and risks — before taking a dietary supplement. Supplements come in several forms: pills, liquids, powders or bars. They may replace the essential nutrients you are missing in your diet, but they are not a substitute for a healthy diet. Dr. Gold suggests that supplements that have a positive outcome are generally turned into a regulated medicine. As a result, they are better studied, dosing is better understood and risks are clearly identified. For that reason, he looks to use medicines, rather than over-the-counter supplements, to help his patients achieve a health goal. Dr. Gold has seen firsthand the harmful effects of bodybuilding supplements. Many of these have creatine, an amino acid that may build muscle, but can also damage the kidneys. He’s also found many of these supplements have high levels of caffeine, which can cause muscle breakdown, hyperactivity and agitation. The biggest concern, Dr. Gold says, is that people often don’t share what supplements they’re taking with their health care provider. Ginkgo biloba can thin your blood, so it is problematic when used with a blood thinner. John’s wort can build up in the liver and cause interactions with other drugs, such as antidepressants. Ephedra is a stimulant that can cause high blood pressure. Ginseng can cause bleeding in patients who are taking blood thinners. Kava kava can cause liver damage with overuse; some patients have even needed a liver transplant. Black cohosh used for menopausal symptoms may cause liver failure. UCLA Health provides patient care focused on the prevention, diagnosis and treatment of health concerns. You can request an appointment online or by calling 800-825-2631.